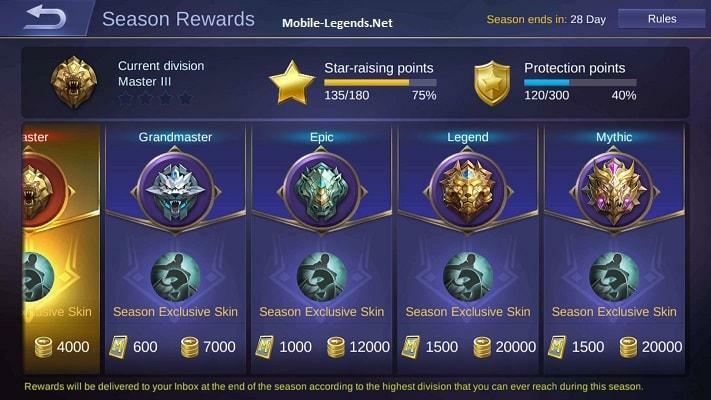 Mobile Legends Season 7 will end soon! Get awesome prizes with your rank! Tickets, Battle Points and perfect Season 7 Exclusive Skin! We will fight until the end! Join us and destroy the enemy! Learn the rules, be polite and don’t forget this “TeamWork is OP”! Each season lasts for three months, and new season will begin once the current one ends. Rewards will be sent to your mailbox based on your highest rank during the previous season and your final rank at the end of the season. Your initial ranking in the new season will be based on your final ranking at the end of the previous season (the higher your ranking in the previous season, higher your ranking will be at the start of the new season). You must reach Lv. 8 and own 5 or more heroes to play Ranked Mode. Players will be matched based on their performance. You can invite your friends to play ranked matches with you, but you can’t queue as a four-player team. Teammates must all be of the same rank, or within a range of up to two ranks of one another. There are 7 ranks in ranked mode: Warrior, Elite, Master, Grand Master, Epic, Legend, Mythic. Players ranked at Epic or above must complete in Draft Pick Mode (Grand Master of Above for Advanced Server players). You get one star for every victory in ranked games, and lose a star for every defeat. When you have the maximum number of stars, you’ll be promoted to the next rank. If you lose all of your stars, you’ll be demoted to a lower league. You can’t lose stars when at Warrior rank. When at Elite rank, if you encounter teammates who disconnect from the game or go AFK, you’ll have one chance per day not to lose stars. In Draft Pick Mode, if one of your teammates goes offline during the first 3 minutes, the Early Surrender function will be activated. The teammates of the AFK player can choose to initiate an early surrender within the 3rd and 4rd minute of the game. 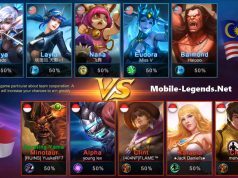 If the surrender is successful, the AFK player and any friends they’re in a pre-made team with will be severely punished, and the ranking of the other players will remain unchanged. Mythic is the highest division in ranked play, and the top 50 players at Mythic rank on every server will receive the Glorious Mythic title. Players who reach Mythic and Glorious Mythic rank can unlock exclusive avatar borders. In addition to simply gaining a star for every victory and loosing a star for every loss, there are also Star-raising Points which can allow you get stars faster and protection Points which can counteract star reductions. You can get Star-raising Points when you win a ranked game, and will get Protection Points whether you win or lose. More consecutive wins will grant you more Star-raising Points, and you’ll get more Protection Points if you perform better than your teammates in a game. When your Star-raising Poimts are full, they’ll be converted into an additional star. When your Protection Points are full, they will all be consumed to counteract a star reduction when you lose a match. The upper limits of Star-raising Points and Protection Points increase with your rank. I want to know the list of demotions. do you know when the season 7 end? 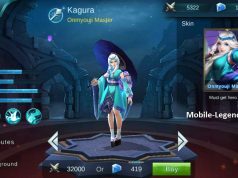 Why i didnt receive yasha skin?i am epic in rank..
really give the moskov skin in grandmaster rank? I did not get reward of season , new season is going to start in 1 hour , you guys are cheating with us , as we didn’t get any reward , i am in Grandmaster rank but still got no reward . In my new account I have reach lengend 5, 1 star but i did not get season end reward. But at my old account was also at legend 1 and i get season end reward. Why i am not getting season reward at my new account.